If you're like me, Spring can never come too soon. And nothing says Spring like new flower blossoms. This year, treat yourself to an abundance of Spring in one of these famous floral travel destinations. It's the world's largest spring flower garden. The Keukenhof Gardens are a showcase for the Netherlands' biggest agricultural export: flowers and bulbs. The tulip is the ultimate symbol of a Dutch spring, and there are an astounding 7 million bulbs – tulips and other spring flowers - bursting into bloom on the 80 acres of castle grounds at Keukenhof. Open just a few weeks every spring, Keukenhof is a gardener's dream: themed garden plots and pavilions, an windmill you can climb for a viewpoint over acres of surrounding tulip fields in bloom, boat rides in canals lined with never-ending blossoms. You can also order bulbs of the blooms you can see at Keukenhof; they'll be shipped to you ready for planting in the fall. There's a Dutch connection to this flower festival in Canada's National Capital. During the Second World War, the Dutch Royal Family took refuge in Canada's capital, and a royal baby was even born on Canadian soil, as overseas, Canadian soldiers led the liberation of the Netherlands. In thanks, after the war, the Dutch sent tulips. 100,000 tulips, and tens of thousands more each year since. 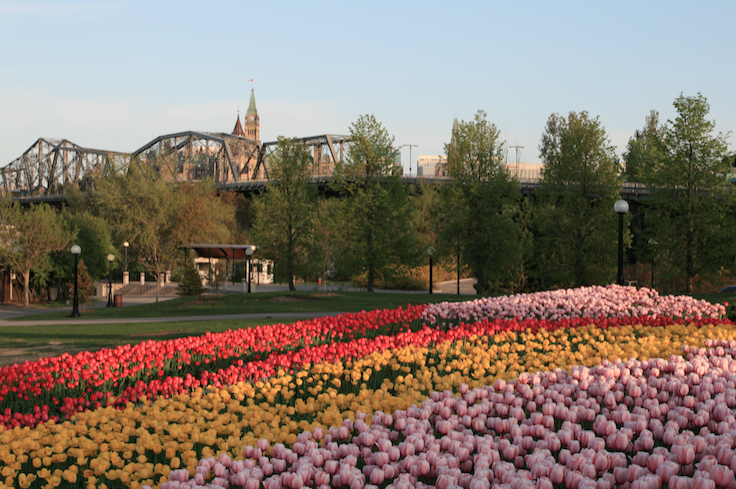 The mid-May Ottawa Tulip Festival is not only a symbol of Spring, it's a symbol of peace and cooperation between nations. This might be the most famous flower and landscaped garden show in the world. Members of the British Royal Family join garden lovers from around the world at the 11-acre site of the Royal Horticultural Society's annual love-in of traditional, trend-setting and even avante-garde flowers and gardening. You'll see glorious displays of beautiful and also rare spring flowers, floral exhibits and cutting edge design as well as traditional English gardening that is loved and imitated the world over. 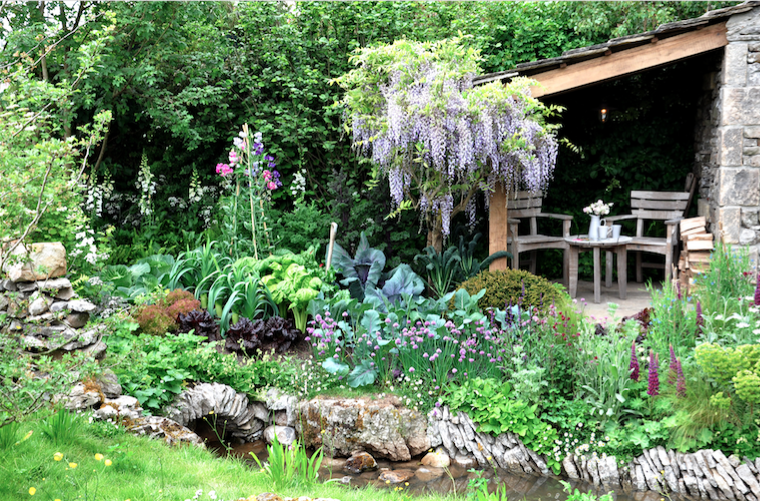 The Chelsea Flower Show is the perfect place to buy English gardening tools and gifts for yourself or your friends at home. The Japanese don't just have a word for cherry blossoms: 'sakura'. The also have a word 'hanami' that means to view the cherry blossoms. It's a tradition that dates back a thousand years or more, originating with the Imperial Family and continuing today for all Japanese. 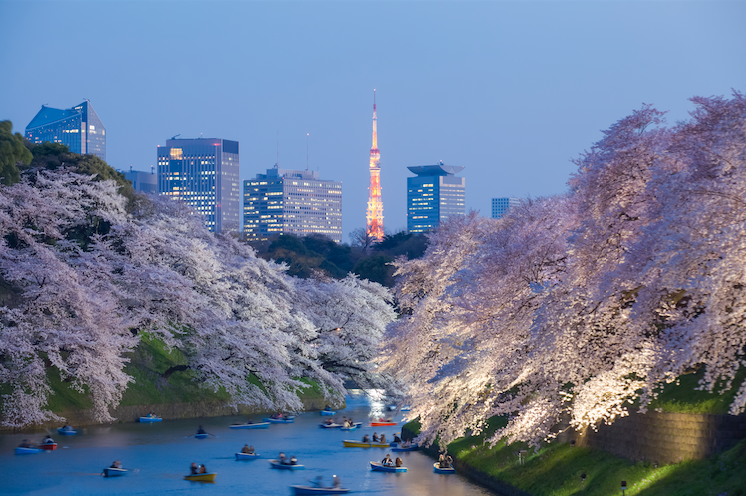 It's one of the most festive times of the year, when Japanese gather with friends, family and colleagues under cherry blossom trees filling parks, surrounding historic castles, temples and shrines, and lining riverbanks, drinking sake and picnicking under the trees long into the twinkling evening hours. It's not just the stunning beauty of clouds of white and pale pink blossoms hovering overhead; the Japanese also view short-lived cherry blossoms as a poetic symbol of the fleeting nature of life itself. An estimated 50,000 blossoming cherry trees line streets and grace parks from February all the way through April, including the city's famous urban Stanley Park. The Vancouver Cherry Blossom Festival is held every year for most of the month of April. 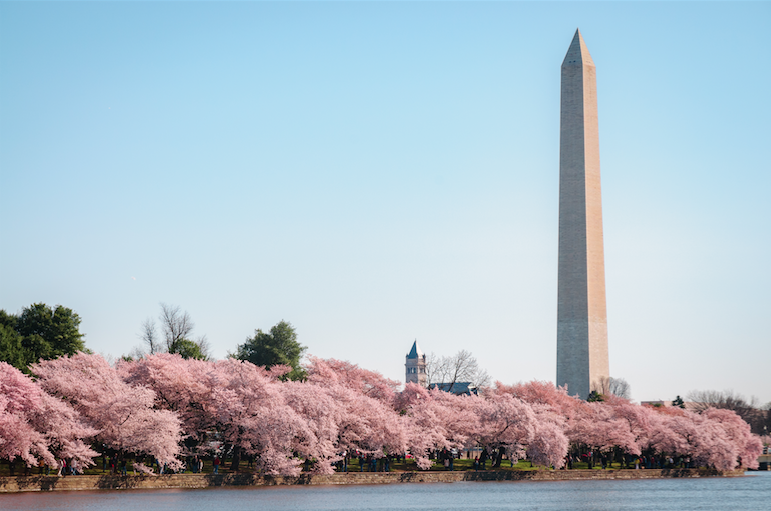 America's capital has a glorious annual reminder of the thousands of cherry blossom trees given by Japan to the US in the early 1900's as a sign of friendship. Famously lining the shore of the Tidal Basin, DC's cherry blossoms are celebrated annually during the National Cherry Blossom Festival from mid-March to mid-April. This wildflower is the state flower of Texas and believed to be named from its resemblance to a pioneer sunbonnet. 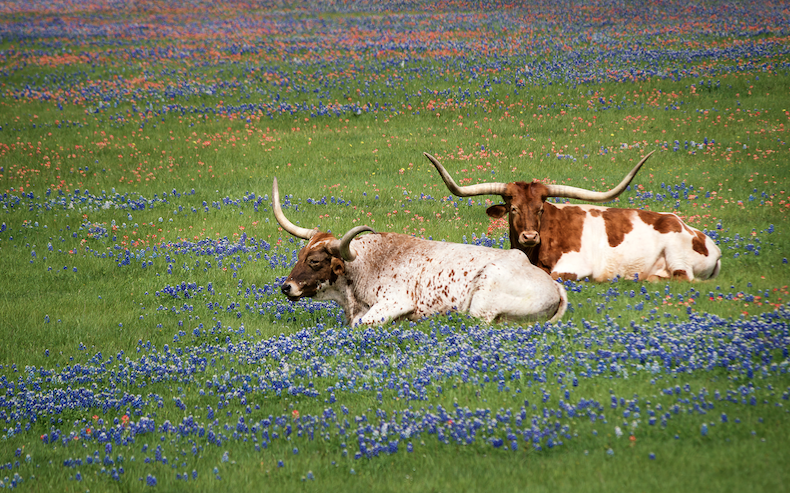 Bluebonnets are actually several varieties of lupins. They thrive in lesser soil and so line roadways as well as fill public lands and pastures. The city of Ennis, south-east of Dallas-Fort Worth, is the official home of the bluebonnet, with over 40 miles of flower-bedecked roadsides, as well as an annual Festival. The Texas highway department not only delays roadside trimming so people can enjoy the spring bloom, its early officials were instrumental in encouraging these wildflowers to thrive. Today, they still plant about 30,000 pounds of wildflower seed each year, contributing to the preservation of Texas' native vegetation. In Canada's maritime provinces of Nova Scotia, New Brunswick and Prince Edward Island. 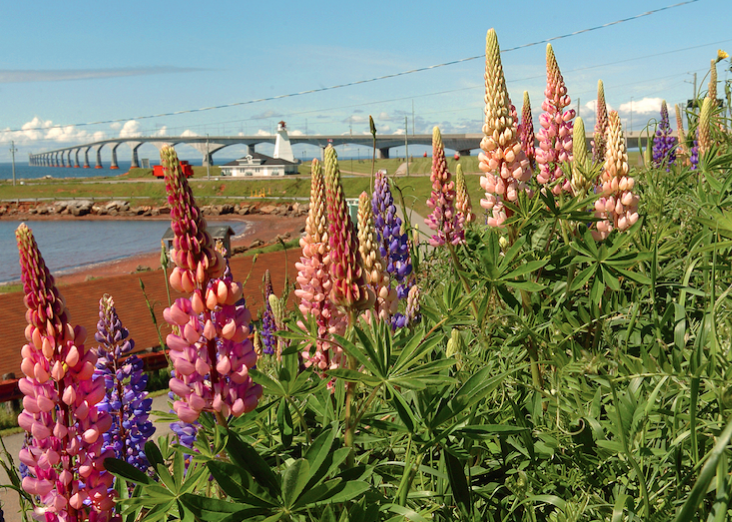 The lupins you'll find growing wild in Canada's eastern provinces are a larger variety than Texas bluebonnets, and although they're more purple-y blue as well as pink and white, they're an equally cheerful sign of spring. Well, actually early summer. The cooler climate means peak lupin season here is late June – early July. Azalea shrubs originated in Asia and were successfully taken to many places in the world. But in America's south-east, they've gained a special place as an iconic garden favorite and symbol of gracious Southern living. Unlike other spring blooms, they're quite long lasting, spreading joy for weeks of the season. 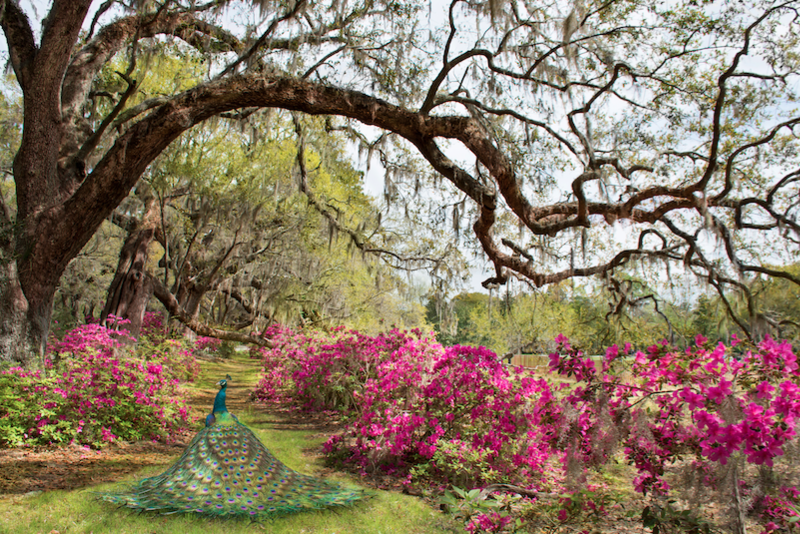 Many public and private gardens have a spectacular spring showing of azaleas, but special mention goes to Charleston's Magnolia Plantation and Gardens. The former rice plantation dates from the 1600's, and is the oldest public gardens in the U.S, opening its doors in 1870 to visitors who wanted to enjoy its thousands of cultivated flowers and plants. The less-formal, 'Romantic' style garden is not only on the list of one of 'America's Most Beautiful Gardens'. Magnolia was also the first garden in the country to plant azaleas outdoors, in the 1840's. Today, hundreds of thousands of azaleas bloom in flame pinks, oranges and reds, lining paths and lakes in a breathtaking spring bloom.